I hope you are all well and enoying this peaceful evening. We will be gathering tomorrow evening at St. Augustine's Church on Lower College Road in Kingston at 6 PM. We will enjoy sitting/walking/sitting meditation, we will hear a short talk by Thich Nhat Hanh on Love and share the Dharma. Mary and Emil will co-facilitate. It should be lovely. I hope you will be able to be with us. 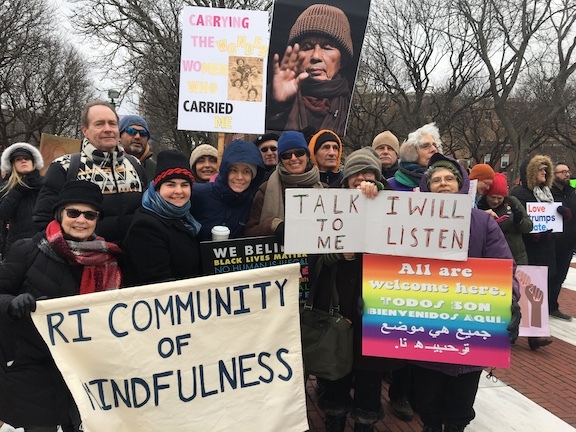 Thanks to all who were able to join us at the State House on Saturday to joyfully stand up for peace, love and justice. It was fun! Let's build a model of love and respect and care for ourselves, each other and the planet. In the process, let's enjoy every moment!